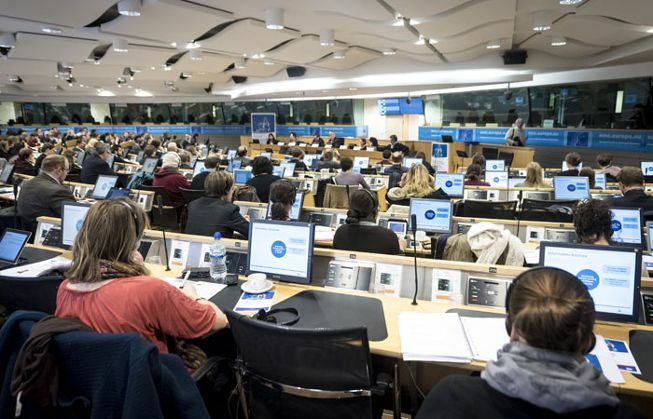 The Labour Market Observatory of the European Economic and Social Committee (EESC) hosted the seminar in cooperation with the European Foundation for the Improvement of Living and Working Conditions (Eurofound). EPN and more than 280 participants from 24 countries attended this event which took place the 22th of February 2016. By the end of 2015, more than 1.250.000 people had sought asylum in the EU. Member States are differentially affected by the refugees’ arrivals. Notwithstanding 2013/33/EU directive laying down standards for the reception of applicants for international protection, refugees policy are decided at national level by each EU member States and remain heterogeneous. For example, national regulations for waiting time for labour market access to asylum seekers vary. Each EU member State also offers different integration facilities (language training, adult education, skills assessment, civic education, job-related training). Speakers agree about the need of a common EU asylum system or, at least, of an intergovernmental agreement to unify refugees hosting. Speakers also consider the refugee status as a specific type of migration. There are several benefits of labour market integration. Work is an important integration mean because individuals feel recognize when they can participate to production society. Work avoids refugees’ poverty at short and long-term. Negative perception of migrants by local people could be reversed knowing that refugees are not assisted inactive peoples. Work integration of refugees can be a economic growth factor, even more in sectors facing workforce shortage. Labour market integration involves the implementation of basic conditions in hosting countries. Language training is essential. Indeed, late access to language training have a significant bad impact on job-seeking. On the contrary, combining language course with professional training reinforce motivation. It is also important to recognize skills and diplomas. Refugees often do not have proof of past working experience and/or education. Labour market integration also requires stable housing in order to allow school attendance and job-seeking. These kind of facilities should be quickly organised for refugees as late integration make it more complicated both the them and the hosting society. However, EU member States’ legal contexts hinder integration pathway. Long asylum seeking processes force refugees to inactivity. The short-time limitation of work/residence permission de not allow refugees to engage in several years training. Resettlements give sometimes rise to Catch-22 situations between residence permit and work permit as refugees need one to get the other and vice versa. Also, the current Dublin Convention remains problematic and refugees decide to postpone their registration or to not register at all. In order to make refugees integration easier, the hosting countries should also consider to use other social activities (sport, culture,…) to rebuild refugees’ social networks; to involve social partners to assist the refugees and avoid their vulnerability on labour market; to provide them access to information about refugees facilities and social security and employment agency national systems; to better inform social workers and employment agency workers about refugee status’ rights; to extend existed employment aid measures to refugees, and to develop public-private partnerships to train and hire refugees. Three good initiative on refugees integration have been highlighted. “Mentoring for Migrants” in Austria help migrants to develop a career plan, identify and organize further training, establish contacts, optimize application processes, get job interviews, build self-confidence, develop a business plan to pave the way to self-employment. Within the “Fast track to Integration” program in Sweden, migrants’ personal skills and expertise are assessed against what the industry require with a view to their employment, while attending language courses. In Belgium, non-profit organisation “Duo for a Job” organizes intergenerational job search mentoring for young immigrant by experienced retired seniors.